This is a single strand necklace and, at eighteen inches (plus pendant hang), it is choker length. The shorter length prevents "swing" on this necklace. This necklace will hug you. This is a simple, hard-to-find classic. 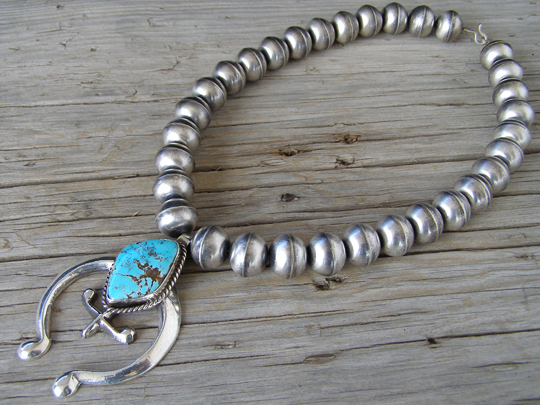 The naja is set with a free-form stone of natural, untreated Pilot Mountain turquoise from Nevada. Hallmarked C. HALE and stamped Sterling on the back of the naja pendant. Length of bead necklace (excluding naja): 18"